This “hybrid control box” is designed for HARVEST off-grid solar air conditioners. If there is grid power available, this “hybrid control box” can make off-grid solar air conditioners run under hybrid mode. Battery power in priority status, grid power play a role of backup energy. There are 1 x power adapter, 1 x solar charge controller, 1 x power supply switch PCB and 3 x circuit breakers built-in inside the “hybrid control box”. Indicators of power supply Solar/Grid on cover of hybrid control box. This hybrid control takes maximum energy from solar to save energy consumption from grid power. If voltage from solar panel is enough to drive air conditioner, the power supply will be from solar panel directly. If grid power is not available, the power supply will be switched to battery power. 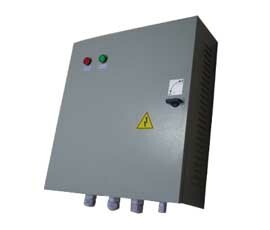 This hybrid control box use minimum energy from battery, which make battery backup time as long as possible.